Late January, 2013 – Huatulco is a small community where people not only run around in crazy vehicles designed for short hops on small roads, but where visitors and residents easily become friends. 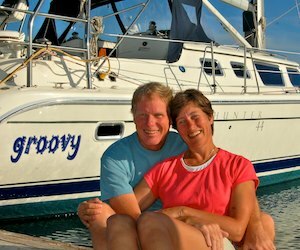 Every time we landed at the dinghy dock, the guard Antonio would call out, “Groovy, Groovy!” and a chorus of friendly greetings from the tour boat operators and other people around the docks would follow as we emerged onto the streets. We ended up chatting with the many street vendors day after day, practicing our Spanish and learning a little about them. And whenever we went to “The Ché” (Huatulco’s sole supermarket), we invariably bumped into someone we had recently come to know. 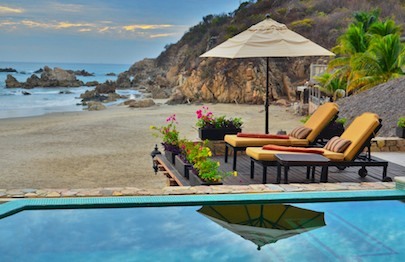 It seems that everyone who visits Huatulco quickly agrees it is an unsung paradise worthy of frequent return visits. The winter residents are a tight knit group too, and suddenly we had a new circle of friends from the US and Canada who had vacation homes here. We’ve found that most Huatulco tourists have vacationed for years in other more well-known parts of Mexico before discovering this quiet jewel. We spent many happy hours chatting with very well traveled folks from Argentina, Brazil, Mexico City and Europe. I hadn’t realized it at first, but my various blog posts about our wonderful experiences in Huatulco had developed a little bit of a local following. Online sharing travels quickly, and without intending to, my pics and stories had garnered interest from many of the good people that have invested in Huatulco and want to see good vibes about it advertised in an understated, “word of mouth” way. Writing strictly from the heart — as I always have — about our many fun escapades here, I discovered I was inadvertently helping their cause. 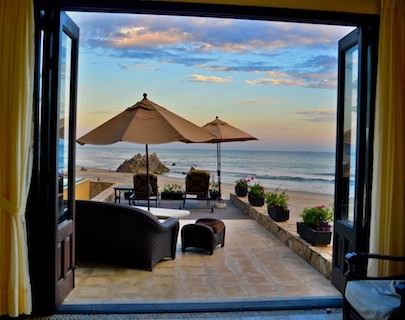 There are huge views to the beach from every room. 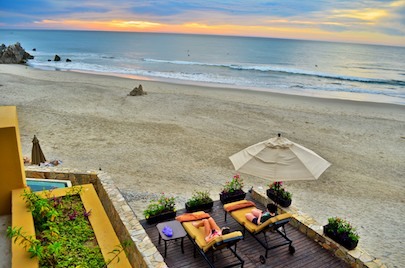 Out of the blue, we received an email message from the people at MyHuatulcoVacation.com (which we later discovered is a local vacation property rental company). 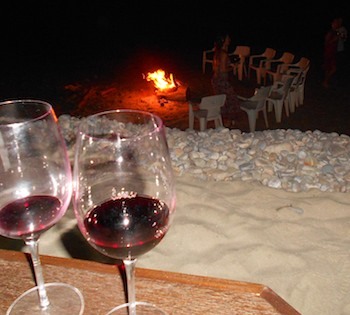 The email invited us to meet up with their team at one of the properties they represent to share a dinner and a beach bonfire together at Playa La Bocana. Now, mind you, we’ve received our fair share of emails from lottery winning Nigerian chieftains that are dying to give us a portion of their winnings if we’ll just mail them a certified check for ten grand. 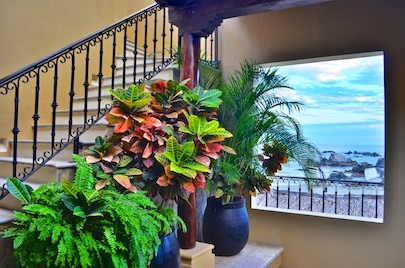 Views from Villa Escondida hang like paintings on the wall. But this was different. For one thing, the email message didn’t have any spelling mistakes or that wacky English grammar typical of those Nigerian internet pranksters. 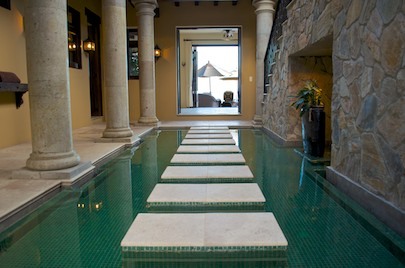 Better yet, all we had to do was show up at Villa Escondida on Playa La Bocana. 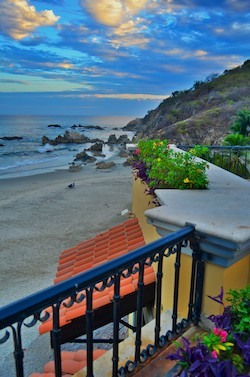 We love La Bocana’s stunning, windswept, rugged surf beach, where nature plays with a raw kind of wildness and abandon. So what a thrill it was to to be entertained at a gorgeous beach house we had admired from a distance on our previous visits. 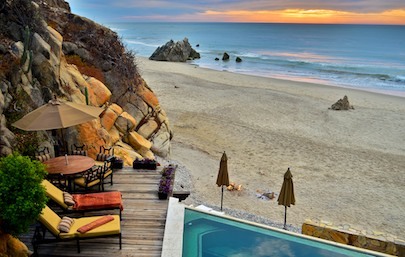 Stately and grand, with pillars, pools and views, this beautiful house sits right on the beach where the surf pounds with a mesmerizing roar, almost within arm’s reach. Mark and I rushed straight up to the roof deck to check out the views. Awesome views from the roof deck. 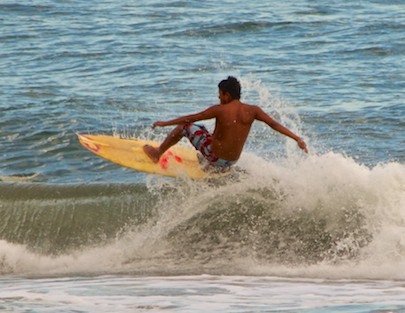 Loads of surfers were riding the waves, as the Gulf of Tehuantepec had been blowing with enthusiasm for a while. As we watched the surfers, our cameras clicked in unison. We soon realized the hot bikini clad girls had it all over the boys when it came to skill and survival in the waves, and we laughed as we said to each other, “It’s her! She’s up! Get it, get it! !.” The surfers flirted tirelessly with the unruly waves. 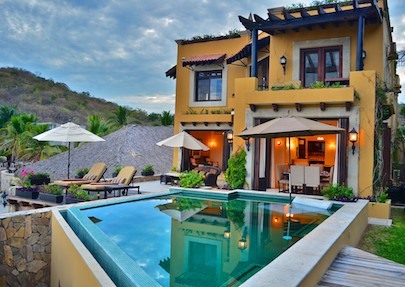 Villa Escondida sits right on the beach. 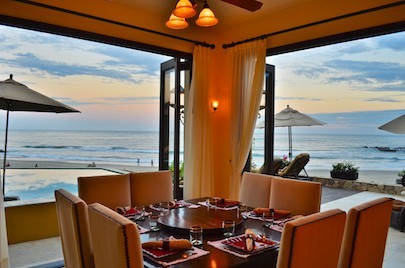 Our hosts turned out to be a collection of fun-loving people that had arranged for a gourmet dinner to be served on fine linens and beautiful tableware overlooking the beach from the home’s breezy dining room. The occasion was a farewell feast for their Canadian contingent that had visited for ten days and was headed home the next day. With quiet grace, our chef announced and brought out course after course to the table, while the sun disappeared into the blackening sea just beyond the open windows. Exchanging wide-eyed glances, Mark and I kept secretly thinking about those microwaved bean burritos we would have otherwise been having on the boat. Going from a sumptuous squash soup to an elaborately prepared quesadilla dish to a phenomenal main course that disappeared so quickly and went down so well I that have no idea what it was — except that it was awesome — all made us wonder if anyone at the table really knew just how down-and-dirty a cruiser’s lifestyle is…blogs be darned. 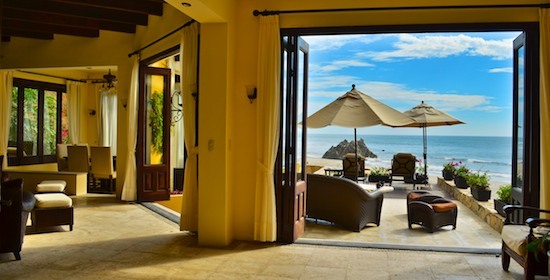 Vacationing in Huatulco can be glamorous: staying in a luxury property, dining on the finest foods, and taking a brief barefoot evening stroll in the sand while wearing an elegant dress and carrying a glass of expensive wine. Our companions for this evening were truly devoted to making those kinds of heavenly, tropical, dream vacations come true, and we were savoring a taste of what that is like. But there is little of that kind of glamor living on a boat!! For us, most days bring the same old food from the same old chefs wearing rather tired clothes!! What a shock it was to be invited to stay in the honeymoon suite at this house, where the doors open onto a deck above the beach, the shower is as large as our stateroom, and plush, lily white robes awaited us after we bathed. Down on the beach, the bonfire went late into the night. Despite coming to Huatulco with two different perspectives — ours as two tourists on a boat loving the place and theirs as a group of business people seeking to give tourists the most pleasurable vacation experiences possible — we found we had a lot in common. For starters, like most people who have lived and traveled extensively in Mexico, we had all come to love Mexicans and being in Mexico. Our conversation ranged far and wide about how we’ve learned a new set of values by spending time here. The local people we have met value their family, friends and community in a way that many of us from more developed western nations have forgotten. The prize at the end of the rat race isn’t as eagerly sought after here, which gives everyone more time and energy to enjoy simply being themselves, rather than working so hard to be something else. 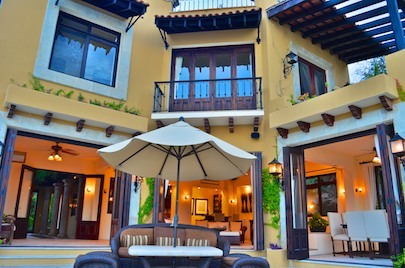 As ex-pats living much of our lives in Mexico (and, for our hosts Judy and Valerie, running a business here), we have also each taken a big leap of faith to try a new lifestyle in a foreign country. Following your heart and pursuing your dreams is fulfilling in a way that nothing else can be. Yet it requires a degree of fearlessness to take that plunge. And then there’s the big dose of life lessons waiting for you when you splash back to the surface and sputter with mixed terror and glee: “What the heck did I just do?” We had all experienced both the immense satisfaction of living our dreams as well as that occasional deer-in-the-headlights shock of trying to square the dream with reality. Our beach bonfire went long into the night. 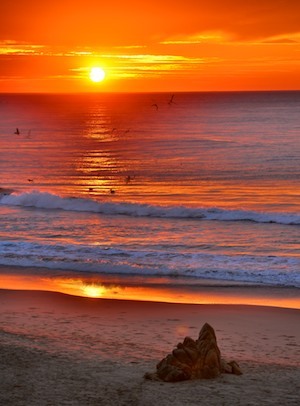 The sun rose in spectacular shades of orange the next morning, lighting up the beach in a burst of color. 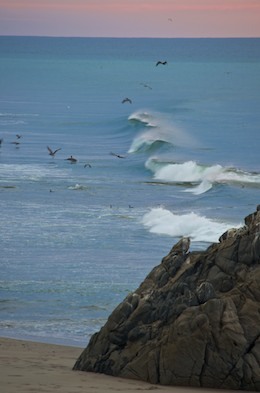 Mark and I took reams of photos while the fishing boats and seabirds puttered across the blue and orange waves. Judy and Valerie, the key MyHuatulcoVacation.com team members, had to run off early to tour yet another luxury vacation property (what a job they’ve created for themselves! 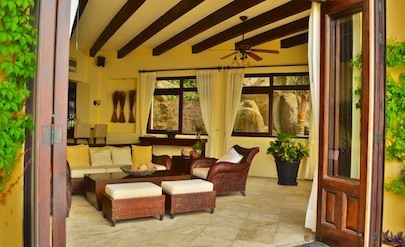 ), while Mark and I lingered at Playa La Bocana, soaking in the morning air as the beach slowly came to life. It had been a night and morning to remember, and the beauty of the place and our lively late night conversation with new friends enveloped us in a warm feeling of contentment. In all our travels, truly our best adventures have been the ones that came looking for us. How very cool and surprising it was to have this one seek us out online. The Tropical Resort Vacation Gods kept watch over us a while longer, and suddenly we found ourselves back at Las Palmas Villas resort (which turned out to be another one of the gorgeous luxury vacation properties that MyHuatulcoVacation.com represents). What incredibly good fortune… We were on quite a roll!!! 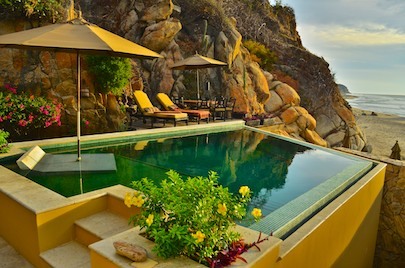 This entry was posted in Mexico's Mainland Pacific Coast (South) and tagged Huatulco, Mexico, Mexico's Mainland Pacific Coast (South), New, Resorts, Travel, WP Travel by Roads Less Traveled. Bookmark the permalink.